A house has just been demolished and we have plenty of old wood from the window and a left alone table top removed from the frame arms of the table. We are then going to utilize and use these interesting old scraps and put them to use in providing some arbour where the string beans can grow and cling to and produce fresh organic and safe vegetables for the family. We just love cooking it with a sinigang recipe (tamarind pork soup). As you can see from the pictures I have provided, we’ve started to grow string beans at the backyard small area where a house has been demolished. The first picture above shows you how small the string beans were after 1 week of watering and seed planting. 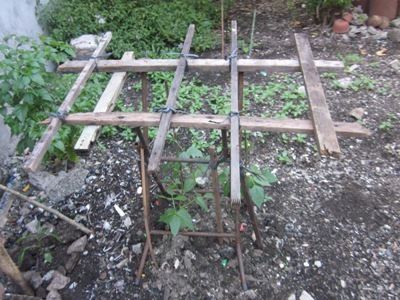 Our problem at that time was that we didn’t want to buy plastic or anything to use for trellis so we decided to look in to the old scraps from the demolished house at the compound and found an old wooden window frame and table arms to use instead as arbour.